Hi Friends! Feeling stressed? Hopefully not. But if you are, I have something you can try to quickly de-stress. I stumbled upon this a bit when I was feeling really stressed at work several years ago. A feeling of being trapped started to weigh on me in times of stress at the office. The urge to just go outside grew stronger and stronger. And so what did I do? When I first started working, a couple of my co-workers sometimes went for a quick stroll through the office park. They’d been doing it for awhile before inviting me along. Eager to get to know my co-workers, I took them up on it. We’d do a quick loop (basically) through the parking area, walking in between buildings. The office was in Charlotte, NC where office grounds commonly have plenty of greenery. There were small buildings sprinkled throughout the area and tons of grass and trees. It was lovely. But what I didn’t know at the time was how powerful being around all that greenery really was. In recent years, I’ve heard more about this idea of nature helping you de-stress. It totally made sense. But, I never really researched it. The other day, I found this awesome National Geographic article featuring David Strayer who is a cognitive psychologist at the University of Utah, specializing in attention. What he and other researchers suspect is that nature works primarily by lowering stress. Compared with people who have lousy window views, those who can see trees and grass have been shown to recover faster in hospitals, perform better in school, and even display less violent behavior in neighborhoods where it’s common. Such results jibe with experimental studies of the central nervous system. Measurements of stress hormones, respiration, heart rate, and sweating suggest that short doses of nature—or even pictures of the natural world—can calm people down and sharpen their performance. In Sweden physician Matilda van den Bosch found that after a stressful math task, subjects’ heart rate variability—which decreases with stress—returned to normal more quickly when they sat through 15 minutes of nature scenes and birdsong in a 3-D virtual reality room than when they sat in a plain room. So yea, feeling stressed? Try looking at trees and grass. In person is better, but according to the above article snippets, photos will apparently help too! 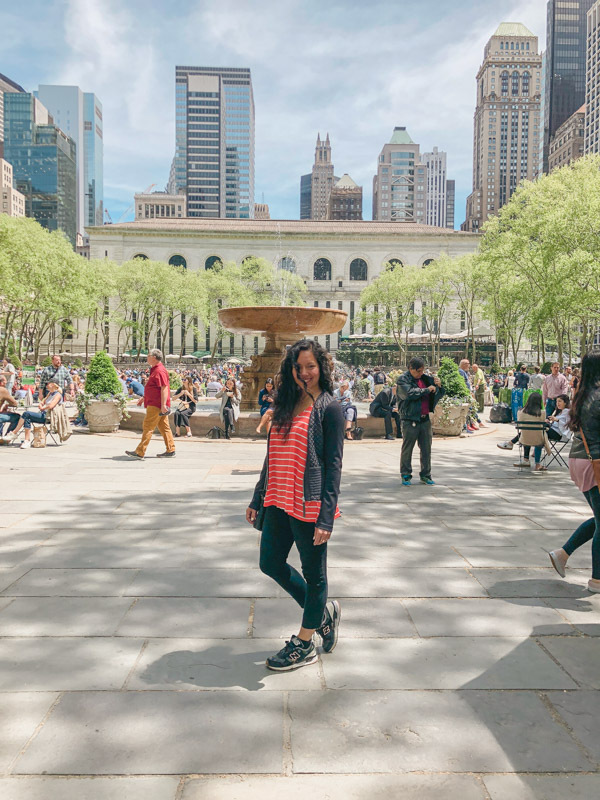 Here’s me de-stressing by taking a quick stroll through Bryant Park. I often eat lunch here too to get some greenery into my day. Feeling stressed at work / home / where? Do you use nature to de-stress? What do you do? Share your tips in a comment below!